The increasing number of connected objects, be it computers, smartphones, tablets or other, it becomes increasingly important to maintain a WiFi connection anywhere. In this guide, we will study the different specificities related to the use of the WiFi in a boat, the different equipment that can provide wireless link quality, and cases of the most common figure. This guide brings together a maximum of information, it is really intended to allow you to choose the best solution for your needs. The installation of a wireless system aboard a boat involves understanding how the environment and the mobility of the ship will impact the Wifi connection, depending on the material used. The same structure of the boat ausi may in some cases hamper the proper functioning of a wireless system by attenuating the signal, whether it is a composite shell, aluminum or steel. - Install an external WiFi antenna. The external antenna will not suffer the signal attenuation due to the structure of the boat. By positioning a little high, it will also reduce the influence of possible obstacles on the quality of the wireless link. - Use a Wifi adapter performant.C'est the combination of features of the WiFi adapter and antenna that will determine the overall scope of the system, and the quality of the wireless link. For an efficient system, choose a WiFi adapter has both a good sensitivity and a high transmission power, coupled with a quality antenna. - Tube-U (G) This is the entry level of the Alfa Tube series, with a Realtek RTL8187 chipset and up to 54Mbps. It offers excellent radio performance, both in sensitivity that transmit power. - Tube-U (N) passes to a newer generation chipset with the Tube-U (N), which will support the 802.11n standard with a throughput up to 150 Mbps. - UV-Tube Tube UV combines the qualities of the two previous models, namely excelentes radio performance and latest generation chipset allowing a rate of up to 150 Mbps. - Tube Tube-2H-2H is more than a Wifi adapter, it can also be used as an Access Point or Client Bridge for example. It is powered by PoE via its ethernet port, and is configured by a web interface. Its configuration requires better knowledge network to a WiFi standard USB adapter, it will be for connoisseurs. Whatever the model chosen, the Alfa tube will be connected to an external antenna. For use on a boat, it is important to note that the antenna can not maintain a fixed position in a specific direction, because of the movements of the boat due to waves (roll, pitch ...) . Indeed, even berthed a boat moving. In these circumstances, the use of a directional antenna requiring accurate positioning is not possible. It is therefore necessary to choose an omnidirectional antenna allowing cover 360 °, and select a high gain in order to obtain a substantial range. In this way, even in case of roll or pitch, the connection will remain stable. - 12 dBi Omni Antenna offers the best space / performance. It measures 112 cm. Because of its great length, it can not be fixed to the adjustable bracket + fixing for Alfa Tube. It comes with a mounting flange for mounting mat. - 15 dBi Omni Antenna is the best in terms of scope, it is the most efficient antenna. It measures 162 cm. Because of its great length, it can not be fixed to the adjustable bracket + fixing for Alfa Tube. It comes with a mounting flange for mounting mat. Modern needs lead to having to connect different devices, such as smartphones, tablets or other over our wireless networks. The use of an Alfa Tube connects a computer only, but there is a solution to redistribute the connection and connect to all devices on board. 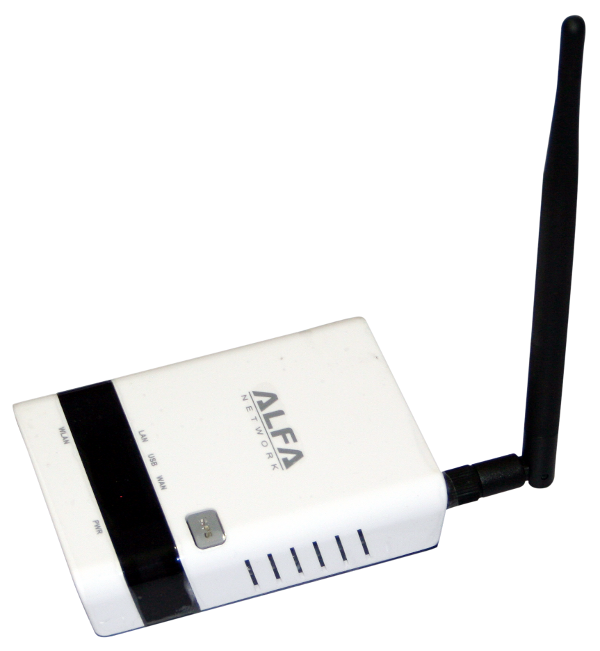 To connect your smartphones, tablets and other wireless customers on a boat, simply connect the Tube Alfa Alfa R36 router, which creates a WiFi extender type of installation. The principle of the WiFi Extender is simple: the R36 will drive the Alfa Tube to connect to the access point or hotspot of your choice, and broadcast locally on the boat a second WiFi network you can connect all your devices: tablets, smartphones etc. The R36 will be perfect to distribute the WiFi connection. It must be used with a compliant Alfa Tube. - Tube-U (G) compatible with the R36, in default firmware release (no need to install a firmware). For outdoor use as it does on a boat, and particularly in the case of high gain antennas and large, we recommend using a surge protector to protect your computer equipment. More importantly, the arrester can also protect the crew, avoiding a fire on board. This model is ideal for direct integration between the Alfa Tube and the omnidirectional antenna: Surge Alfa Network ALR06. To be effective, the body of the arrester must be connected (spade provided) to a submerged metal element which will serve as grounding. This guide details the wireless solutions and the most suitable and most frequently under use on a boat. Apart from the products presented here, we have a wide range including wireless USB card, Wifi Directional antennas, and Sector Panel; Wifi Amplifiers ... Do not hesitate to contact us for any specific need or questions: online contact form.